One of the weirdest things about starting a business is that you have to constantly promote yourself, especially when you’re first getting started. You don’t do it because you need the attention. Very quickly, that gets old and you start to question whether you’re annoying everyone around you. The reason you promote yourself is because if you don’t, your company will literally die. Turns out, the old adage about “building a better mousetrap” is dead wrong. So, a couple days ago when I realized that we just passed a pretty big milestone (100k readers, 5m pages read), I was conflicted about what to do. Obviously joe, Will, and I had a big high five. But should we announce it? 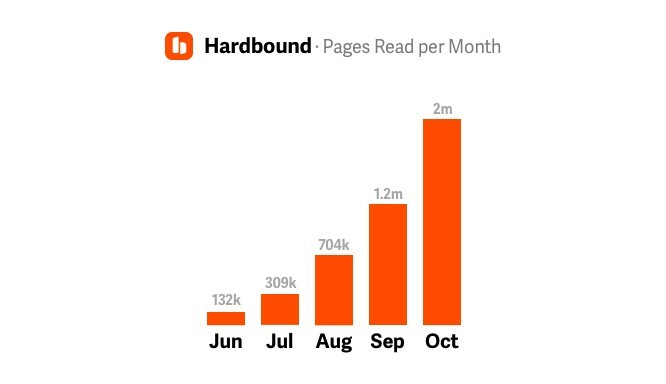 I mean, 100k is a nice round number, but we all know it’s just a “vanity metric” and in the grand scheme of things Hardbound is still tiny. Startups are incredibly hard. joe nguyen and I have been working on this thing for over a year now, and we’ve only gotten this far because of the patience and generosity of our friends, family, investors, and readers. If it weren’t for you (you know who you are), the company would have died long ago. So the first reason to announce it is that it’s not really about us: it’s about you. Thank you. The second reason I wanted to announce it is that I realized it might help us move faster towards our mission of making people feel amazing through stories. We believe there is vast untapped potential in the way that we tell stories on phones — the story consumption device of choice for billions of people all over the world. Our mission is to unlock it. If you can create a better format for telling stories, you create a stronger connection between people’s screens and their brains. This helps people get more out of what they read, which makes them smarter, more empathetic, more courageous, and just overall better people. That’s what personally motivates me, and I know that’s what motivates joe nguyen. We are believers in the power of stories to make us smarter, better people. It’s our ambition to make a valuable contribution in that arena. But I know when I was just getting started I would read posts like these and just wonder if I’d ever be able to build something like that. The process seemed so mysterious and impenetrable. And the founders who write these posts seemed like their main goal was just to appear as impressive as possible. It was clear to me that they weren’t speaking from the heart, and it made their success seem even further from my reach. Like they were some kind of super-human that never doubted themselves. So I promised myself if I was ever writing a post like that, I’d do it differently. When I took my first stab at starting a company 4 years ago, I learned that entrepreneurship is mostly just feeling wrong and being told you’re wrong on a daily basis, being rejected by potential customers, investors, and partners. It’s incredibly difficult to hold onto the kernel of an idea inside you that got you excited enough to want to build something new. It gets warped and you lose sight of it over time. Some days you wonder if it was all just a mirage. So if you’re reading this and wondering if you have the ability to build something that lots of people might one day love, even though it feels like you have no clue what you’re doing now, I can tell you that as I write this I feel like I have no clue what I’m doing. And I can’t say for certain, but I’m sure Mark Zuckerberg feels the same way. The most important thing is to get yourself in a position where you can focus, surround yourself with people who believe in you, and don’t lose sight of the kernel of an idea inside you: the thing that words can only attempt to describe, the mission to somehow improve people’s lives that motivates you. PS — If you haven’t tried it yet, download Hardbound!